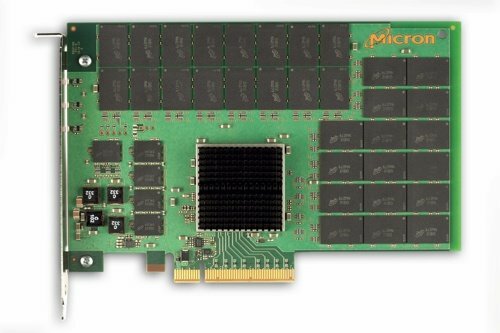 There's fast PCIe flash and then there's Micron's just-announced P320h PCIe flash. PCIe flash is for servers needing minimal I/O delays in fetching data to memory. Instead of having that data on hard disk drives, which have millisecond delivery times, the servers can stir on the cards attached to the PCIe bus and have the data in DRAM in microseconds. Fusion-io is the market leader in PCIe solid state storage with its ioDrive technology. TMS launched its RamSan-70 in mid-May and this took the performance crown. It has just been de-throned by Micron. The P320h does 750,000 random read IOPS compared to the RamSan-70's burst IOPS rate of 600,00 (the average read IOPS rate is 330,000), more than the TMS product's top speed. 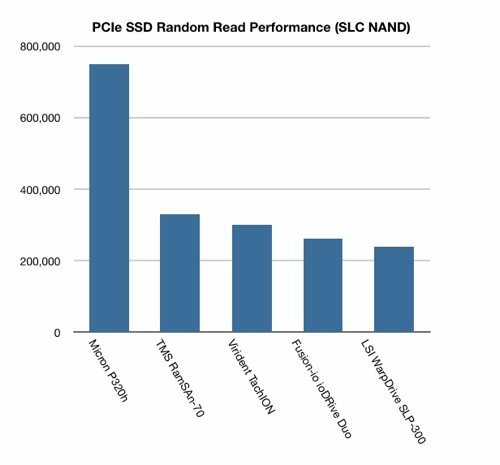 The chart below compares random read IOPS ratings from a number of PCIe cards. They all use single level cell flash, which is faster than the multi-level cell variety. Micron's speedy SSD uses 34nm NAND, and comes in 350GB and 700GB capacity points. The 700GB version does 341,000 random write IOPS, less than the 900GB RamSan-70's 400,000 write IOPS. The 350GB Micron card does 298,000 random write IOPS. The TMS card has a 2GB/sec I/O bandwidth rating whereas Micron's card does 3GB/sec for sequential reads and 2GB/sec for sequential writes. Both the TMS and Micron cards have on-board RAID. The P320h has an endurance of 25PB total bytes written (TBW) for the 350GB model and 50PB TBW for the 700GB one, equivalent, Micron says, to writing 28TB of data a day for five years. Both Micron cards come in a full-height, half-length format with a half-height card coming later in the summer. Other PCIe formats may also be forthcoming. Micron says it has full control over every element in the bill of materials for the card, including the NAND chips which it makes, its ASIC controller, surface mount technology and the card's DDR3 DRAM, which is used to hold tables and add efficiency to the card's operations. Janine Ellefson, Micron's PCIe product marketing manager, says very little processing is offloaded to the host server's processor. She also said Micron is considering bringing out an MLC card. MIcron says the card could support 1,500 simultaneous video streams, running compressed MPEG2 video at 16Mb/sec per stream, or 1.5 million Outlook users. In theory it could replace almost 5,000 SAS 15,000rpm hard disk drives, rated at 153 IOPS each, in an IOPS sense.